July 26, 2007 marks the date of my last relaxer (hopefully)…dare I say forever? So you ask, what made me decide to start this hair journey to become relaxer free? Well, my hair has become weak and fragile as the years go on and I don’t know why! Let’s start from the very beginning! My mother started relaxing my hair when I was in the second or third grade. You see, I don’t come from a family of women who “do” hair; we go get our hair done lol. But, growing up I used to have long, thick hair. Even all of the coloring and heat I used on my hair in college didn’t make me notice a huge difference in my hair right away. But recently I became really concerned because I use heat very sparingly, I only use semi-permanent color rinses (blue-black has been my personal fave), and I used to get my hair professional styled every two weeks, sometimes every week. For the life of me I could not figure out why my hair was acting up! So, being the scholar that I am lol, I decided to do some research. My research began with the intention of just bringing my hair back to life—basically I was just trying to figure out what I had been doing wrong (please check out Healthy Textures –definitely a great place to start). But the more I read and spoke to friends who now wear their hair natural, I quickly saw the benefits of growing out my relaxer. I think the most appealing benefits of going natural for me are versatility and freedom. I am constantly getting bored with my hair. There are sooo many natural hair styles—twists, braids, straight, weave, etc—to choose from, I will never go bored. This may sound corny, but I can’t help but feel somewhat liberated by giving up on the chemicals (I think I will eventually highlight my hair once I am completely relaxer free). Never in a million years, would I have imagined that I would be doing this. But despite my newfound feeling of freedom, I have many doubts and questions running through my head. What will my hair look like or do once all of the relaxer is gone? Will I regret this decision? Am I committed and strong enough to do this? Recently I have just felt crazy (thank you to everyone who has been supportive thus far). 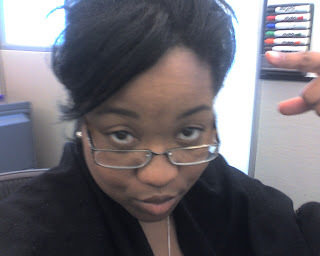 Not only am I growing out my relaxer, I am growing out my blue-black rinse. We all know that black rinses never wash out! So not only am I experiencing the difference of textures, but I have two different colors going on—medium brown and blue-black! You can only imagine what that looks like. Argh. So to make a very long story shorter, the purpose of this blog is to document my experience mostly for myself. If other people can benefit along the way, even better! Wish me luck! I'll be your "AA Sponsor" if you need support at times... ha! lol! so are you wearing your hair out now... or do you have it in braids? Yay!! My last relaxer was 7 months ago. If you ever feel weak...google search some of the chemical ingredients in your realaxer. SCARY. I totally feel you! My last relaxer date was April 30, 2007 and I'm still going strong! It does feel liberating a bit.